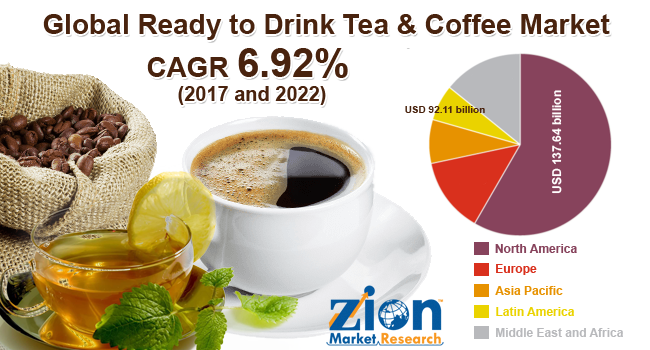 Zion Market Research has published a new report titled “Ready to Drink Tea & Coffee Market (RTD Tea and RTD Coffee) for Canned Packaging, Glass Bottle Packaging, PET Bottle Packaging and Others: Global Industry Perspective, Comprehensive Analysis, and Forecast, 2016 - 2022”. According to the report, the global ready to drink tea and coffee market was valued at around USD 92.11 billion in 2016 and is expected to reach approximately USD 137.64 billion by 2022, growing at a CAGR of around 6.92% between 2017 and 2022. Ready to drink tea and coffee market is instant energy drinks and a segment of the soft drinks industry. RTD tea and coffee are perceived as a part of lifestyles in major countries across the globe. The major factor driving the RTD tea and coffee market include compatibility of different flavors and the improved nutritional benefits of the products. Increasing per capita income along with growing population and rising health awareness is expected to bolster the global ready to drink tea and coffee market over the forecast period. Another factor trending the global ready to drink tea and coffee market include changing retail distribution scenario along with the high growth of e-commerce sector. Rising demand of on-the-go health drinks has largely impacted the consumption of ready to drink tea and coffee market, especially in the developed region, owing to less number of working population and less time for making food at home. Substitution of ready to drink tea and coffee for carbonated drinks is again one of the important factors for the growth of the market. On the basis of packaging type, the market is segmented into canned packaging, glass bottle packaging, PET bottle packaging, and others packaging. The PET Bottle segment is expected to dominate the ready to drink tea and coffee market over the forecast period, attributed to high consumption and low cost of the PET bottle. However, canned packaging segment is gaining importance in the market and is expected to grow to a higher CAGR by 2022 over 2017. By product type, the market is segmented into ready to drink tea and ready to drink coffee. Among which ready to drink tea is expected to account for relatively high revenue share, whereas, ready to drink coffee is expected to expand at a rapid rate over the forecast period. On the basis of the distribution channel, supermarkets/hypermarkets segment accounted for lion’s share in the global ready to drink tea and coffee market contributing more than 1/3rd revenue share in 2016. Conversely, food service segment is growing at a relatively high growth rate of around 6% over the forecast period 2017 to 2022. By geography, the ready to drink tea and coffee market is mainly segmented into North America, Europe, Asia Pacific, Latin America, and Middle East & Africa. Among the aforementioned regions, Asia-Pacific is projected to be the fastest-growing regional market between 2017 and 2022. The emerging economies of the Asia-Pacific region are a major market for ready to drink tea and coffees and are increasingly contributing to their demand, due to rise in disposable income, increase in population, and growth in the demand for processed foods. After the Asia Pacific, North America is another region which exhibits significant growth in coming future. The report also includes detailed profiles of end players such as The Coca-Cola Company, PepsiCo Inc., Sapporo Beverage Co., Ltd., Ting Hsin International Group, Nestle S.A., Suntory Holdings Ltd, Arizona Beverage Company, Asahi Group Holdings, Danone SA, Monster Beverage Corporation, Starbucks Corporation, Uni-President Enterprises, Hangzhou Wahaha International Group Co. Ltd., and Unilever NV.